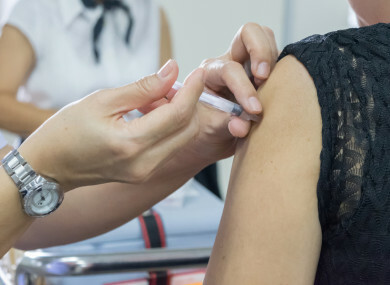 THE HEALTH PROTECTION Surveillance Centre (HPSC) has urged people in high-risk groups to get vaccinated against influenza. The number of reported cases of influenza-like illness (ILI) in Ireland has increased in the past week and flu is now actively circulating. Last week, the GP consultation rate for ILI increased to 20.3 per 100,000 population, up from 6.8 per 100,000 the previous week. ILIs have increased in all age groups except 0-4 years. Cases of influenza in hospital and residential care facilities have also increased. Although flu is starting to circulate, cases remain at a low level. Dr Kelleher said: “People in at-risk groups can get the vaccine for free as they are at much greater risk of becoming seriously unwell if they catch flu, and sadly many end up in hospital. The symptoms of influenza usually develop over a matter of a few hours and include a high temperature, sore muscles, dry cough, headache and sore throat. This is different from the common cold, which tends to come on more gradually and usually includes a runny nose and a normal temperature. “Anyone who gets flu should stay at home, rest, drink plenty of fluids and use over-the-counter remedies like paracetamol to ease symptoms. Anyone in one of the high-risk groups should contact their GP if they develop influenza symptoms. Advice and information on getting over the flu and other common illnesses are available here. Email “People urged to get flu vaccine after jump in cases of influenza-like illness”. Feedback on “People urged to get flu vaccine after jump in cases of influenza-like illness”.